Synopsis: A page-by-page critique of famed interventionist economist John Maynard Keynes' magnum opus The General Theory of Employment, Interest, and Money. 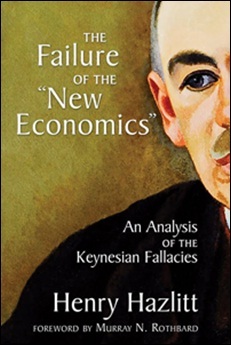 Keynes' book, written in 1936, took the academic and political world by storm and dominated policy making ever since its first appearance, to the detriment of society. Hazlitt's critique was written in 1959. Strong Points: This book does its job and does it very well. It smashes Keynesian economics by exposing it at its source - Keynes' General Theory. Hazlitt, being an absolute master of economics, not surprisingly did an excellent job of dismantling Keynes' work. He also highlighted how incredibly befuddled, self-contradictory, convoluted, and poorly thought-out Keynes' General Theory really was. Weak Points: Due to the specialized nature of the book, it was highly technical, and therefore not well-suited to the layman reader. It is not to be compared with Hazlitt's enduring classic Economics in One Lesson, and is not nearly as interesting.